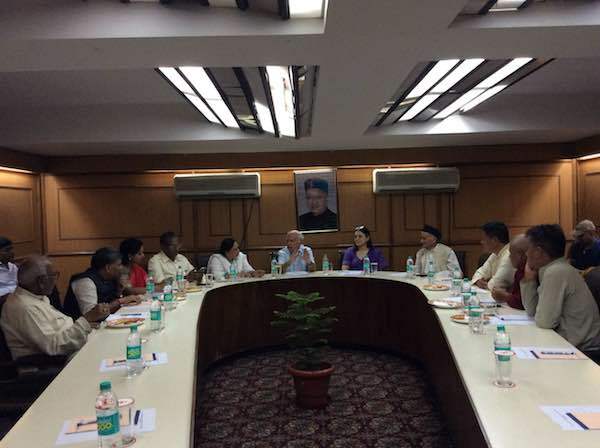 (TibetanReview.net, Aug13, 2015) – A cross-party grouping of Indian MPs who support the Tibetan movement have met in New Delhi on Aug 11 evening to discuss the issue, with the participation of exile Tibetan MPs. The discussion was held in the Himachal Bhavan and was presided over by its convener, Mr Shanta Kumar, a former chief minister of Himachal Pradesh and who had also served as a union minister. Apart from the convener, the other Indian MPs who took part in the discussion organized by the group, the All Party Indian Parliamentary Forum for Tibet (APIPFT), included Ms Maneka Gandhi (BJP), Mr Bashista Narain Singh (JDU), Mr Ninong Ering (INC), Ms Kavita Kalvakuntla (TRS), Mr Bhagat Singh Koshyari (BJP), Dr Udit Raj (BJP), Ms Kanak Lata Singh (SP) and Dr Arun Kumar (RLSP). The meeting began with Mr Penpa Tsering, Speaker of the Tibetan Parliament in Exile, being asked to brief the forum on the current situation in Tibet. He said China’s policies in Tibet were aimed at destroying their cultural and ethnic identity. The participating Indian MPs expressed concern that serious human rights violations were taking place in Tibet even in the 21st century, that China was transferring its population into Tibet in order to destroy the Himalayan region’s historical cultural and ethnic identity. They reaffirmed the forum’s continued commitment to the Tibetan issue. Exile Tibetan MPs Mr Karma Yeshi and Acharya Yeshi Phuntsok also took part in the discussion.